Mainly because were tired of watching your near-death experience. You don't want to end up like this! 1. This boy who learned the importance of taking the skateboard with you. 2. Taking the skateboard with you is an important lesson. 3. This dad who may have gotten a vertigo attack. 4. The boy who can now sing falsetto due to skateboarding. 5. The guy who decided to breakdance a bit at the end of this jump. 6. The boy who decided depth perception was not important for skateboarding. 7. The guy who thought skateboarding was too hard, so he tried snowboarding. 8. 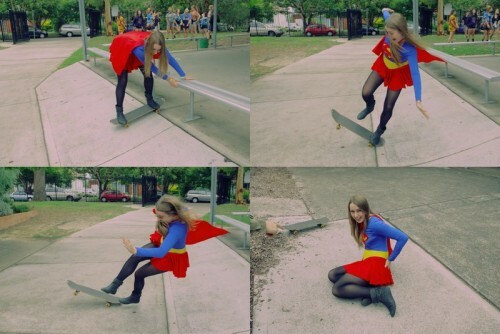 This girl who turned out to not actually be Super Woman. 9. The guy who enlisted his friend as a ramp. 10. The boy who turned the tables on the skateboarding world. 11. The guy who learned that skateboards exact revenge. 12. The guy who learned that skateboards exact revenge. 13. The guy who learned that skateboards exact revenge. 14. The guy who decided to inspect the structure of the ramp real fast. 15. The guy who should stick to sleds. 16. The kid who learned skateboarding does not combine well with other sports. 17. The guy who wisely decided to sit on his skateboard to try this. 18. The girl who got talked into this in a bikini. 19. The guy we all feel bad for. But this kid gives us hope! But everyone, meet the master.